My 29 year old daughter, a vociferous, enthusiastic Obama supporter, is becoming acquainted with the Kennedys this past week, she is beccoming inspired forty years later by their dedication to the politics of care "for the least" of us. I found myself telling her about the scrapebook of Jack Kennedy that I made as a 16 year old, the enthusiasm I felt watching him , and those wonderful press conferences. I have a renewed admiration for Teddy. What's lived experience for us, is ancient history for many young people. Glad to hear that Laura is discovering this history. The Kennedy family met a lot to me too. 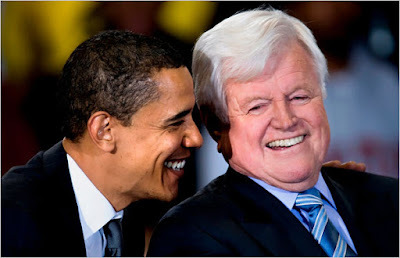 The recent death of Ted Kennedy brought tears to mine eyes. My mother and father were/was so fond of John F Kennedy . My mother often spoke of JFK ,his wife Jacqueline and children as if they were a close friend. It seems like a story of family has come to end.